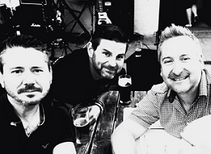 The Mofos are a highly experienced Maidstone-Based 3-piece Rock covers band, established in 1999 and come highly recommended. The band adopt a highly adaptive approach to recreating tracks close to the originals and are available for hire for an assortment of events including pubs, clubs, weddings, parties, corporate events, student balls etc. If you've not seen the band before, checkout the events calendar and get yourself down to a gig! Want to learn about the history of the band? Click HERE! Since June 2016 The Mofos became a three-piece and are steadily building up a brand new set list. The following is a sample of some of the tracks in the current Mofos playlist. Generally the band tries to blend a mix of Indie, Rock and Cheesy element to their sets in order to appeal to a wide audience. For special events we are always happy to discuss any specific song requests or choices. Thanks to one of our dedicated Mofonians (Kelly Sands), he has kindly compiled a YouTube video playlist of a selection of tracks we play. To see and listen to the videos, click on the YouTube logo. To download a PDF format playlist click HERE.